SBIRS-GEO (Space Based Infra Red Sensor - Geostationary) is the geostationary component of the SBIRS-High program, which will replace the DSP system of early warning satellites in providing early warning for Intercontinental Ballistic Missile launches. The SBIRS sensors are designed to provide greater flexibility and sensitivity than DSP and can detect short-wave and expanded mid-wave infrared signals allowing the system to perform a broader set of missions. These enhanced capabilities will result in improved prediction accuracy for global strategic and tactical warfighters. The SBIRS-GEO spacecraft is a 3-axis stabilized satellite with a Overhead Persistent Infrared (OPIR) scanning sensor and a staring sensor. Sensor pointing is accomplished with pointing mirrors within the telescopes. The GEO scanning sensor will provide a shorter revisit time than DSP over its full field of view, while the staring sensor will be used for step-stare or dedicated stare operations over smaller areas. In October 2012 Lockheed Martin was awarded an US$82 million contract to begin initial work on the fifth and sixth geosynchronous satellites. 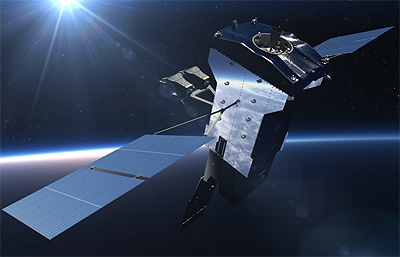 The US$1.86 billion award for the completition of the fifth and sixth satellite was awarded in June 2014. Beginning with these satellites, Lockheed Martin will use the modernized LM2100M platform. The FY2019 budget proposal calls for cancelling SBIRS-GEO 7 and 8, to shift the funds previously allocated for these satelllites to develop the new Next Generation OPIR system.